Aww yeah..... Joystiq has posted confirmation that Star Wars Battlefront: Elite Squadron will be coming to PSP & DS "this fall"! This is such awesome news.... seriously, makes my gaming year. The press release suggests that the DS and PSP are getting subtly different games, with the DS version promising a "class-based gameplay experience" with different weapons for each class, and the PSP version allowing players to "personalize and build their character with more weapons and items than ever before." The PSP game has 16-player multiplayer with "in-depth stat tracking," and the DS release has "intense 4-player skirmishes" in different multiplayer modes. Check out the gallery for the PSP & DS versions-- the DS version is obviously not as graphically polished as the PSP of course-- but the most notable thing is that it looks more of a top-down kind of player view, like X-Men: Legends or Marvel: Ultimate Alliance, those types of games. I wonder how that's going to affect gameplay. To be honest, to say that Star Wars Battlefront: Elite Squadron PSP will be a DAY 1 purchase for me is a given. As soon as they announced the game, I'm going, "so where do you want my cash?" But I have to admit, I will probably also buy the DS version too, unless I start hearing a lot of bad things about it. I might wait for reviews on that one.... there's never been a Battlefront game for DS, so this is pretty exciting. Unlike Renegade Squadron, which was the first NEW Star Wars Battlefront game for the PSP, I feel a lot more reassured that the franchise won't get mucked up. There are no guarantees, but I suspect that they won't stray too far from the formula. 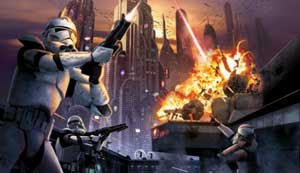 The PSP port of Star Wars Battlefront II, which was handled by Savage Entertainment, was pretty weak, even for a port. In some ways it was very faithful to the game, but there are some system-freezing bugs, and the controls just didn't feel tweaked enough for the PSP. I still play it every once in a while, but Renegade Squadron is the definitive Star Wars Battlefront PSP experience. We still need some hard details: "coming this fall".... when exactly? October? November? I wouldn't be surprised if they scheduled it for September, but then push it back to those months like they did with Renegade Squadron. UPDATE: Gamespot has said that Rebellion is doing the PSP version, and n-Space is developing the DS version. Oh boy. This is hands-down my most anticipated game of the year.